On Jan. 28, 2019 Google released the results of thousands of users “click stream data.”* This data shows consumers no longer follow a linear path to purchase. Consumer searches are unpredictable, opportunistic and time dependent. The co-founder of Google Ads, Fredrick Vallaeys, said the dimension of “time” is increasingly important in today’s hyper mobile search culture. People want immediate answers even if they don’t purchase immediately and each consumer’s journey is unique and dynamic. Some consumers start with broad searches and narrow down to brands. Others don’t care about brand but look instead for specific needs. Today a consumer searches dozens of times before buying and may take weeks between their first search and purchase. From a digital advertising point of view, agencies and brands must look at the path time lag from first impression to conversion. These metrics are available in your Google Ads account, but few marketers know how or where to look for them. The example below, from one our clients, shows 9.48% of their conversions come 12+ days after first impression. If 10% of your consumers take 12 or more days to decide before purchasing are you staying with them that long? If not your competitors are, and they will take market share away from you. Resist the temptation to use anything but your Google Ads and analytics attribution data to make decisions about your customer’s digital journey. In other words, don’t guess. Many US Marketing clients think they know their customer. Seeing the the data will confirm the true path and time lag and this in turn allows you to make better marketing decisions. Another overlooked area is platform analysis. Some agencies and media outlets throw around terms like “programmatic,” AI, and remarketing or retargeting. But Google’s own bidding strategies and options allow you to do many of the same things third parties charge you for at a fraction of the cost. You can tailor your own media buys using Google’s automated AI bidding. And Google Ads AI uses 70 million signals per second for the latest automation. So you can accomplish budget, branding, engagement, cost per viewable impression, cost per acquisition, or return on ad spend goals. YouTube (the second most used search engine behind Google itself). Shopping (image ads connected to your eComm site for purchase**). Display rich text and images on over 2 million websites including prestigious sites like CNN, Wall St Jr, Forbes, and millions of others. Because you can combine platform analysis with segmentation powerful insights are available. Networks, devices, locations and time day/hour of week are all optimizable inside Google Ads itself. Figure out your customer’s digital path by analyzing the data you already have in your Google Ads account. 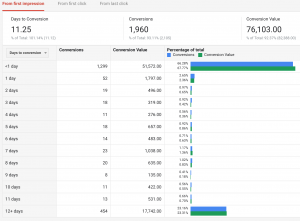 Use data in your Google Ads account. So you can connect the dots between digital platforms, your media buys and your gross profit margin goals. Optimize your digital marketing to capture the customer you want. And this will help you predict your customer’s digital path before your competitors do it. * Google partnered with Verto Analytics. It analyzed the consumer opt-in journey with Verto Smart Cross-Device Audience Measurement. Panel click-stream data of n=2,989 individuals over a period of 6 months. ** Shopping ads require a Google Merchant Account and a feed to your Google Ads account.